If you have made up your mind to launch a retail website, then you won’t find a simpler option than using a website builder. These services are specially created with the needs of newbies in mind, but they are also in demand with proficient web developers, who focus on designing client websites. The reasons to launch a retail website are versatile and numerous. Establishing web presence is a must for your offline retail business, if you wish to expand it and reach the foreign users. By getting a website, you get in touch with the target audience in a quick and hassle free way – just provide the data about your business, contact details and services you offer to inform the potential clients about everything they might be interested in. Likewise, a retail website may be the number one destination for international partners and clients from abroad. These are the major ways to expand your business, make more deals, increase the sales volume on the web, build customer base and generate profit. Despite the stunning amount of web design options available out there, most users are not ready to face all the hassle and challenges of DIY website development. This is because the prevailing amount of web design tools are quite complicated to be used by non-techies, which may pose the entire idea at risk. Fortunately, there is a possibility to use website builders, which are specially geared towards the needs, skills, requirements and financial abilities of newbies. These systems are easy-to-use and, what matters most, they don’t require any preliminary web design experience or coding knowledge. It’s high time to review the most popular services now to simplify your choice. Website builders make it possible to create stunning, functional and appealing retail websites in a hassle-free and quick way. Mastering them is not a problem for any user with no exceptions, while the result will certainly exceed your expectations. With so many quality website builders available out there, the choice of the best one may be a challenge. It’s not easy for inexperienced users to compare the features, characteristics and plans of website builders. We’ve compiled the comparison list of the most popular services. Have a look at it now. POS (Point-of-Sale) Software. The POS feature makes it possible to sell products and make deals both in offline and online modes, manage the required number of staff accounts, synchronize with the accounting software, share web store management rights, use internal and external card terminals etc. As a result, you can successfully run your retail website in the local storefront as well as online. eCommerce Templates. Software initially targets entrepreneurs willing to establish online presence for their retail businesses. Thus, it offers a long list of niche templates that are responsive and fully-customizable by default. Extensive Synchronization and Integration Options. The software allows synchronizing your account with well-known marketplaces (like Amazon) and integrating with third-party platforms or accounting software (like Quickbooks or Xero). This helps effectively boost your retail website performance, generate more traffic, build customer base and boost sales volume. Appealing Product Presentation. Shopify offers numerous tools and features to entice customer attention by displaying products to the advantage. With Shopify, you can create and manage visually-attractive show windows, add the unlimited lists of products, customer testimonials, quality images and product reviews. The Augmented Reality tool makes it possible to create the detailed product visualization, letting customers explore it in details from different sides prior to starting the shopping process. Marketing Options. Shopify grants access to numerous analytic and statistics tracking tools. Its advanced Live View feature lets you control the performance of your retail website in the real-time mode, thus providing you with detailed info on the traffic changes, number of visitors, percentage of abandoned purchases, conversion rates, locations users come from and other crucial parameters that have serious impact upon overall website performance. Enhanced Security Measures. With Shopify, you can be 100% sure about your website safety. The software offers a set of tools that help prevent scammer attacks and protect the safety of each deal closed. Among the features you can make use of, it makes sense to mention SSL Certification, Fraud Protection tool, Tag and Chip Reader you can synchronize with Shopify POS and other effective security measures. Cost: Shopify doesn’t have a completely free plan yet there is a free trial that lets you test the entire feature set of the service for free during 14 days. To start managing your retail website, you’ll further have to upgrade to one of four paid plans. Their cost starts with $9/mo and ranges up to $299/mo. Mind that Shopify is transaction fee-free, but it additionally charges certain percentage fees for each successfully-completed credit card transaction. eCommerce Engine. The website builder comes with a powerful integrated eCommerce engine that grants access to multiple design customization options. It’s possible to set up shipping and payment details here, create discount coupons, design show windows, set up product import/export parameters, set up tax management options, create and update product galleries, add and manage lists of products, add customer testimonials etc. Mobile-Ready eCommerce Templates. The website builder boasts a rich collection of eCommerce templates, which are quality and mobile-optimized by default. The advanced mobile editor makes it possible to create and manage the mobile version of your retail website without changing its desktop mode. Wix ADI. The Artificial Design Intelligence Tool will come in handy to those entrepreneurs, who are unaware of intricate web design features yet intend to launch a large-scale and decent retail website. Multilingual Support. Due to the advanced multilingual support feature, it’s possible to make your retail website available in several languages. This lets you establish relations with international partners, attract the attention of the foreign audience and strengthen your positions in the international market. App Market. This is the place, where you will find lots of widgets and extensions to be integrated into your retail website to boost its performance. These include Wix Stores, eBay Commerce, Store Metrics, Amazon, Etsy Shop, Webstore Ads, Simpl-e-Commerce and more. Cost: Wix has a free plan that never expires and five paid subscriptions, all of which are quite affordable to all user categories. The cheapest plan will cost you $4.50/mo, while the price of the most expensive subscription constitutes $24.50/mo. You can start exploring the system for free, upgrading to the paid plan any time you want. That’s very convenient for everyone. WooCommerce – is a popular open-source WordPress plugin that makes it possible to add shopping cart functionality to your retail website, thus, letting you create a small-to-medium online store with impressive functionality. As of today, over 350,000 of online stores have been launched with the plugin and many more are under construction. Simple Integration and Set Up. WooCommerce integration doesn’t take much time, but it still requires preliminary preparation and a bit of programming knowledge. Right after you cope with the installation procedure, you’ll be offered a detailed wizard on how to launch a retail website. Just follow the instructions to get started! Impressive eCommerce Features. Being initially an eCommerce plugin, WooCommerce provides a set of out-of-the-box features that contribute to the efficacy of the web design process. There are lots of extensions you can integrate into your project, geolocation support options, opportunity to create mobile-optimized website design and upload/sell digital or physical products etc. Product Management Options. With WooCommerce, you can effectively organize your product assortment, set up and apply inventory management options, add product reviews and customer testimonials, create and update product catalogues, assign categories to all products offered, set up search filter parameters etc. Payment Options. WooCommerce lets you introduce checkout and payment alternatives, accept orders and payments online, create and implement discounts/coupons codes, set up tax and shipping details, use external and integrated analytics tools to keep track of sales statistics, organize mailouts etc. Cost: WooCommerce is a free plugin that does not require any fees to be downloaded and installed. However, the plugin implies hosting installation and offers a set of paid features that help you get the most out of your retail website creation. Speaking about hosting, it makes sense to use the official WordPress hosting – Bluehost. Its feature set is enough to cover the prevailing amount of hosting needs, while the price range is moderate and affordable to everyone. The cheapest Bluehost plan costs $2.95/mo, while the most costly option constitutes $13.95/mo. Responsive Designs. The collection of responsive Weebly designs is quite impressive, while their quality is above the average. Each template is 100% customizable as the system offers multiple tools to give the selected themes unique look. If there is something you are not satisfied with, you can either upload your own template or change the existing theme on any stage of the web design process. CSV File Import/Export. With Weebly, you can upload products from CSV files to simplify the web store creation process and boost the upload speed. eCommerce Features. Among the eCommerce features that contribute to the performance of Weebly-based retail websites, it would be reasonable to mention integrated shopping cart feature, secure payment options, simple product upload and management, product and order tracking, statistics collection system, search filter option etc. Email Marketing. The feature helps keep your customers aware of your retail business events, updates, news, special offers and other valuable info clients may be interested in. Cost: Weebly offers separate plans for ordinary websites as well as for online stores. To launch a retail website, it makes sense to choose among the eCommerce-focused plans. The cost of the most affordable plan will constitute $8/mo in this case (granted that you will make a one-time payment). The most expensive and the most feature-rich Performance Plan is oriented on the needs of experienced retailers. Its cost currently constitutes $38/mo. Impressive Show Window Designs. Squarespace makes it possible to create and update impressive show windows to present the products to the advantage. You will be able to add and manage products, create and organize product galleries, add media files, set up product variation (SKUs), adjust shipping and payment parameters, introduce loyalty programs for regular customers etc. Due to the WYSIWYG editor, you can control each action you undertake during the show window creation process. All the edits you make are automatically saved and you can preview the changes at once. Style Editor. The website builder lets you change the parameters and style of your retail website. What you can do here is to pick specific page styles that are further automatically applied to all the pages, including cover and product pages, blog and event pages, galleries as well as index pages. eCommerce Widgets and Add-Ons. With Squarespace, you can choose integrated widgets and extensions to add social media buttons, photo and video galleries and other eCommerce tools to your retail website. Squarespace Metrics App and Google Analytics tool will help you keep track of your project performance to make the required changes on time. Cost: Squarespace lets you discover the major features and nuances of the website builder during the trial period that extends for 14 days. There are also 4 paid plans you may choose from. Their cost starts with $12/mo for the most inexpensive and affordable subscription and reaches $40/mo for the most costly solution. Whatever plan you will go for, it will come with free domain name and integrated hosting. Building a quality retail website doesn’t have to be a dreadful or challenging experience. Instead, it’s easy to cope with the task by using a reliable website builder that will help design a full-featured and appealing retail website that will drive the attention of the target audience, thus growing the customer base and increasing the amount of sales. 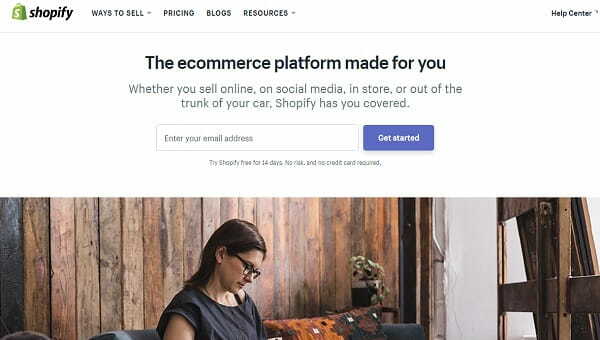 Shopify is the most feature-rich and powerful eCommerce software that lets you build professional retail websites with impressive design and advanced performance. The system comes with a set of tools, features and solutions you need to create a competitive eCommerce project. Wix is the most popular and easy-to-use website builder, which is the all-in-one solution for retail projects that differ in complexity and functionality scale. The system offers user-friendly interface, intuitive dashboard, abundance of quality mobile-ready templates and design customization tools needed to start and manage decent retail websites. WooCommerce is a popular and functional WordPress shopping cart plugin, integration of which results in the creation of full-featured eCommerce projects. The plugin is easy to install and it’s completely free. At the same time, it implies the awareness of coding skills and certain experience to launch a decent retail website. Weebly is an eCommerce-focused website builder, the features and tools of which are enough to launch a nice retail website. The system comes with a drag-and-drop editor, intuitive interface and allows choosing between a variety of quality templates, design customization tools and eCommerce options that let you build a full-featured project. Squarespace is an eCommerce-focused website builder, which works great for the development of quality retail websites and web stores for designers and artists. This is a great platform for users, who intend to showcase their products to the advantage, by organizing appealing show windows and offering a variety of eCommerce features. Picking the right retail website builder may pose a problem to inexperienced users. However, the final choice should be based upon your needs, skills and available budget. If you are looking for a specialized eCommerce website builder, then Shopify, WooCommerce, Weebly or Squarespace are the platforms you should go for. They are feature-rich, functional and niche-oriented. For all those users looking for the all-in-one solution, we recommend using Wix. 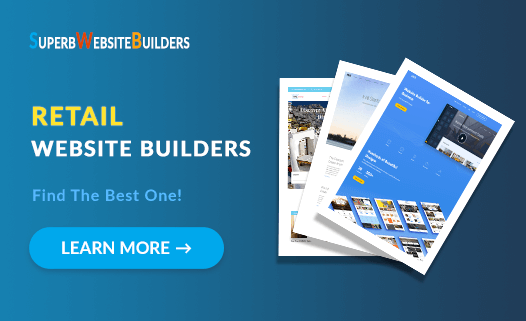 Offering a rich selection of responsive templates, Wix App Market solutions and moderately-priced plans, this website builder is rightfully considered the best in the niche.